April is National Grilled Cheese Month! So let’s celebrate in grand style, shall we? Grilled cheese is a favorite here at home. It is also our “rescue food”, meaning it’s the food we make when there’s nothing left in the fridge/pantry. I mean, who doesn’t have bread and cheese at home? And even when we don’t, the deli is right around the corner and it’s 24/7! Also, to make it even more special, grilled cheese is Tim’s specialty. At some point during our relationship, I decided to trust that he would be able to make an OK grilled cheese so I could get a break from the kitchen. Well, he ended up surprising me and now he’s the official grilled cheese maker of the Mesquita-Sullivan household. This time we are celebrating in grand style! So I’m taking the reins of the grilled cheese making and going all in with a Trainwreck Grilled Cheese that will blow your mind! My sidekicks in this grilled cheese journey are the fabulous cheese maker Arla Dofino and the Eureka! Baking Company. You might be familiar with Arla Dofino as they are the sixth-largest dairy company in the world. They make a delicious range of cheese flavors such as Gouda, Havarti, Fontina and Edam. They also have a “from farm to fridge” mission and their product is free of any added hormones and crafted with only quality, natural ingredients in an environmentally-friendly way. I’m honored to have the opportunity to work with such a high quality product! I believe in nothing but the best for my readers and Arla Dofino definitely passes the quality test when their cheese is concerned! What else would you expect of a company that has been making cheese for the last 100 years?!? For this recipe, I chose to use Gouda for its rich flavor and smooth, buttery texture. I took a bite of the cheese and I let it speak, asking “What do you waaaant, Gouda?”, and the Gouda said: “Caramelized Onions and Maple Whiskey Bacon!”. Oh, and wasn’t the Gouda right? All the flavors in this sandwich were born to be consumed together! The next task would be to find the perfect bread. 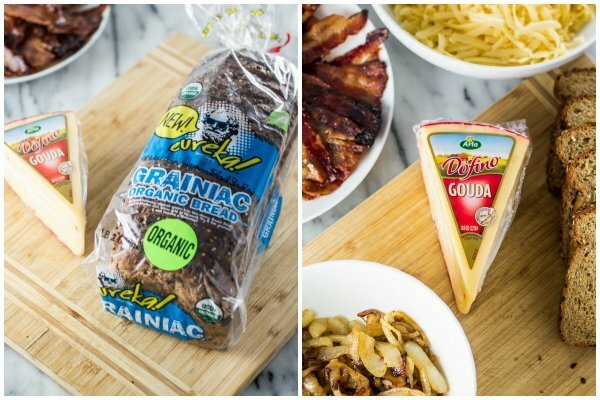 Being a “white bread for my grilled cheese” kinda gal, I was skeptical about Eureka’s Grainiac Organic Bread for this sandwich. But I gave it a shot and Oh My God! 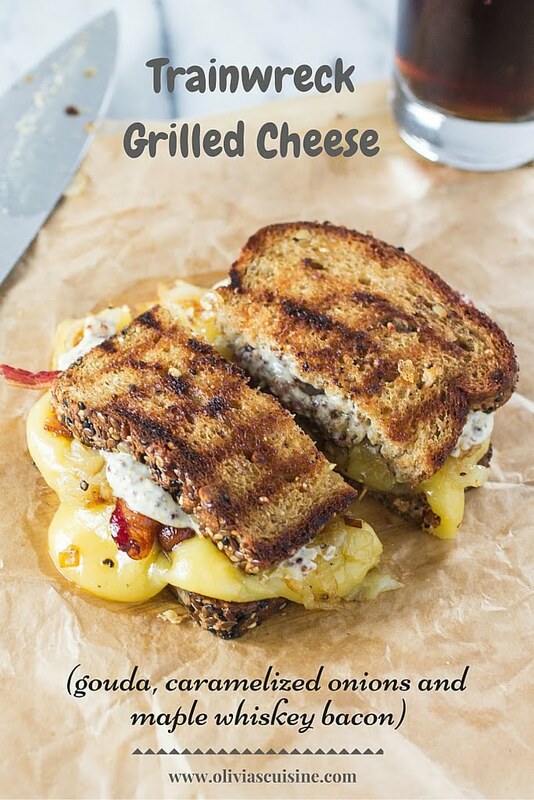 The chewiness and sweetness of this bread pairs like a match made in heaven with the rest of the ingredients to create the unrivaled Trainwreck Grilled Cheese! Why “Trainwreck”, you might ask. Well, after several attempts of naming this grilled cheese and playing with extremely long names, like “Gouda, Caramelized Onions & Maple Whiskey Bacon Grilled Cheese”, I decided this grilled cheese needed a statement of a name! I mean, one bite and you’ll understand the title, I promise. It will seriously make your tastebuds explode with excitement and you might not want to ever go back to the plain old bread, butter and cheese. My husband even described this as “the best thing I’ve ever cooked”. I was taken aback and didn’t know if I should feel flattered or offended. I’ve cooked way more complicated things and so many delicious dishes… but, at the same time, this grilled cheese is really knocking the ball out of the park. Go big or go home, right? To make this sandwich even more special I also added a “sauce” made with mayo and grainy Dijon. 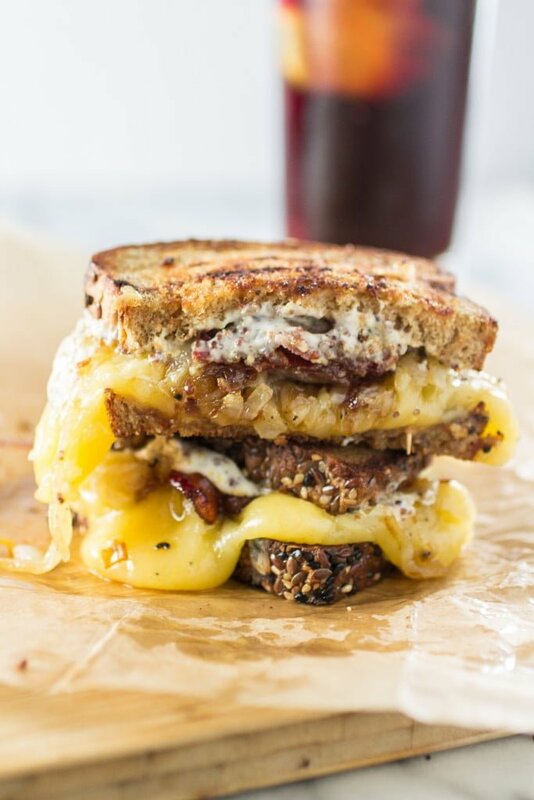 Just close your eyes and imagine: rich gooey Gouda + bacon glazed with maple syrup and good whiskey + delicious caramelized onions + creamy tangy mayo and Dijon sauce + chewy grainy bread packed with fiber. Are you drooling yet? I’m telling you, the flavors will be dancing in your mouth and you will be hooked on this sandwich forever! Do you like prizes? Do you have a Twitter account? And do you wanna make new friends? 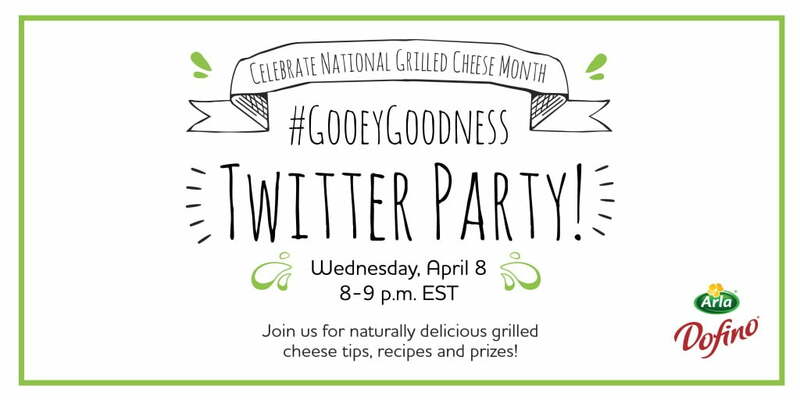 Just login to your Twitter account and search for me @Olivias_cuisine and for the hashtag #GooeyGoodness. Start interacting with your new foodie friends and you might be one of the lucky people to win these amazing prizes! Start by adding the whiskey, the maple syrup and the brown sugar to a medium sized bowl. Whisk everything together until well combined. Add the bacon and toss it until evenly coated with the maple-whiskey mixture. Line a baking sheet with foil and place an oven proof baking rack on top. Lay the bacon on the baking rack in a single layer and bake it for 15 to 20 minutes or until the bacon is cooked and crispy. Drain the bacon with paper towel and, once cool, cut the bacon slices in half. Reserve. Heat 2 tablespoons of butter on a large skillet. Add the onions and cook over medium heat for 25 to 30 minutes, stirring every now and then, until the onions are caramelized. Season with salt and pepper. Reserve. Combine the mayo and the grainy Dijon mustard and mix well using a spoon. Lay the bread slices on a board. On 4 of them, spread each with 1/2 tablespoon of butter. On the other 4, spread some of the Mayo-Dijon sauce. Add the grated cheese to the buttered slices. On top of that, pile the bacon and the caramelized onions. Top with the remaining slices, sauce side down. Butter (1/2 tbsp per slice) the outside of the sandwiches. Preheat your grill over medium heat for at least 5 minutes. Add the sandwiches and grill for 3 to 5 minutes per side or until the cheese is melted and the bread is toasted. Allow the sandwiches to cool for a few minutes, cut them in half and serve. This looks insanely good, Olivia! 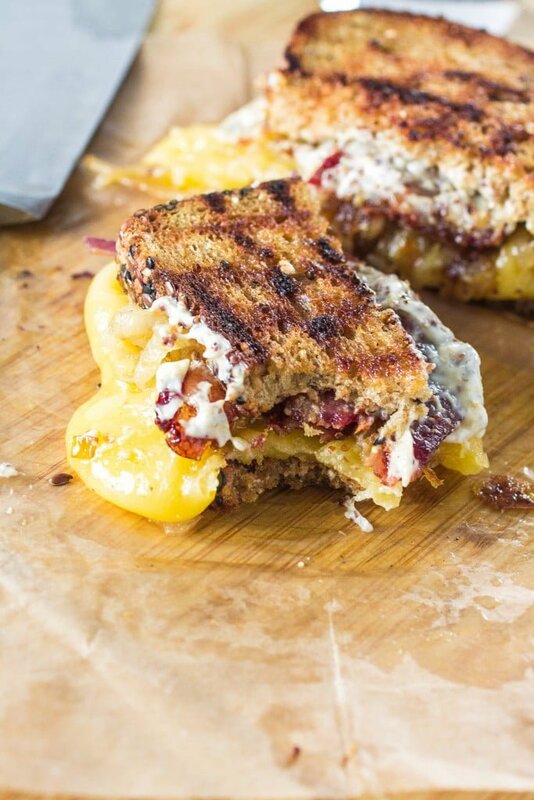 Really wish this had been my breakfast – love all that gooey cheese and bacon! Yummy recipe! 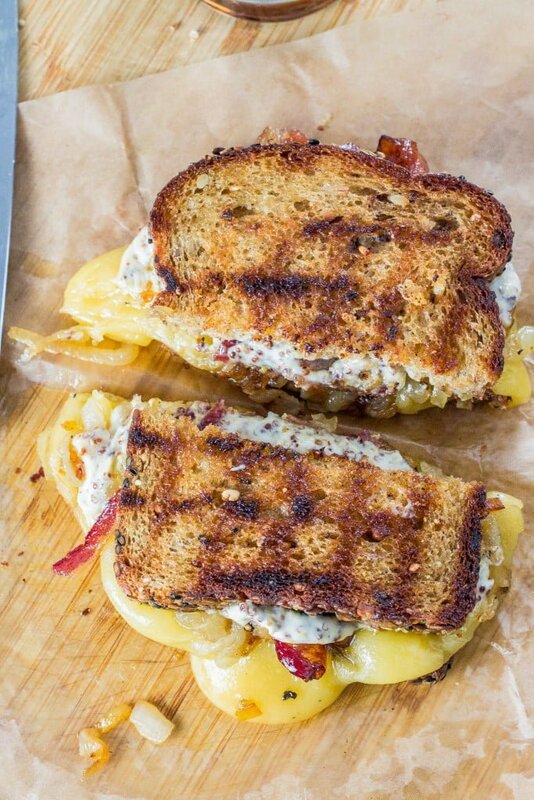 These grilled cheese sandwiches look amazing! 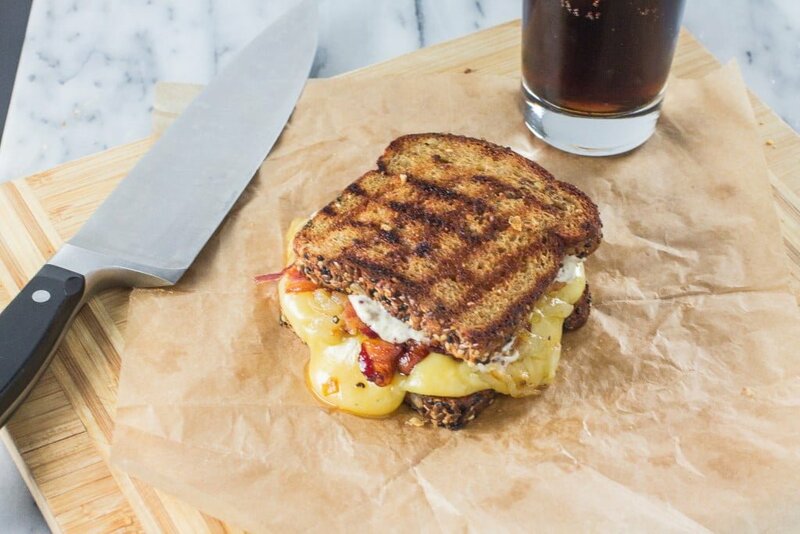 I will definitely need to celebrate Grilled Cheese Month with one of these! But I feel your pain. I’m always so busy testing new recipes that I don’t get to go back to the old ones very often. It’s such a shame! This grilled cheese looks perfect, Olivia! Love the maple syrup and gouda in here. Sounds so good! Olivia, this grilled cheese sandwich looks perfect! No wonder your husband loved it :) I’m new to twitter parties, sounds interesting! What an awesome sandwich! I am so in love with the whiskey maple bacon! I need to go home and make this tonight! I’m officially drooling ;) LOVE the look of your sandwich and of course, it sounds so spectacular. My husband is also the grilled cheese maker in my home, and I did not even bother taking the reins for my post. He made the sandwich for me this time too, hahaha. This grilled cheese looks so good! I actually like Arfa Dofino’s Havarti, but need to get some gouda ! Love the pictures! Train wreck this is not! Looks so delicious! Absolutely mouth-watering! The images are so good I can almost hear them asking ‘bite me, bite me’ LOL! OH MY – cheesy, creamy goodness! Wow, this looks CRAZY delicious! !